Men’s basketball: Is Nate Reuvers the real deal? 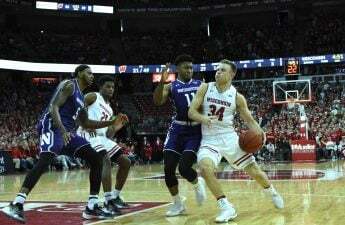 Amid a sophomore season that has seen more efficient offensive production, a 42 percent three-point percentage and the occasional block party, forward Nate Reuvers has drawn comparisons to several legendary Wisconsin big-men, including Frank Kaminsky. So, how much should we buy into the Reuvers hype? Is he the next Kaminsky? Our sports roundtable — including Vicki Dombeck, Justin Mielke, Ben Kenney, Harrison Freuck, and Colton Mosley — has the answer. 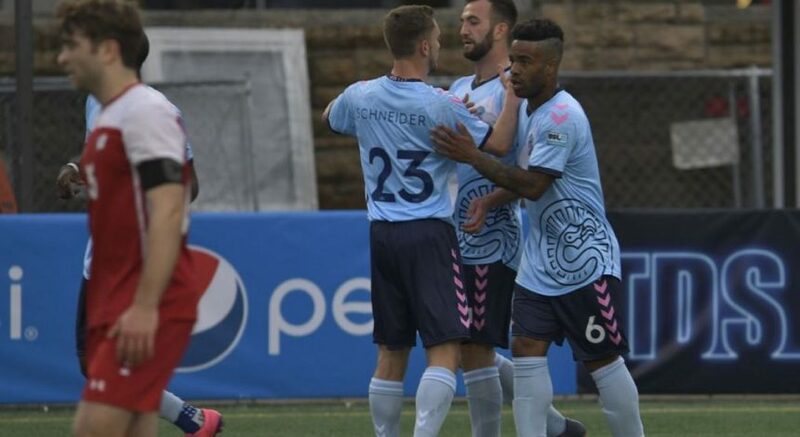 Reuvers has not only exceeded expectations this season, but he is drawing eyes from those who wrote him off after last season’s disappointing end. The biggest thing fans and critics need to realize is that Reuvers is only a sophomore. He’ averaging 8.7 points per game this year, while Kaminsky averaged 4.2 points per game during his sophomore season. Not only is Reuvers getting more playing time than Kaminsky did at the same stage of his career, but Reuvers was originally supposed to be a redshirt freshman this season. After injuries to D’Mitrik Trice and Kobe King last season, Reuvers was thrown into the rotation with little to no expectation that he would have such a crucial role on last year’s squad. It’s unfair to compare Reuvers now to where Kaminsky ended up, but he has two more years to develop his game. Being a big man who can shoot the three, defend down low and score in the paint, Reuvers’ game is quite comparable to Kaminsky’s. 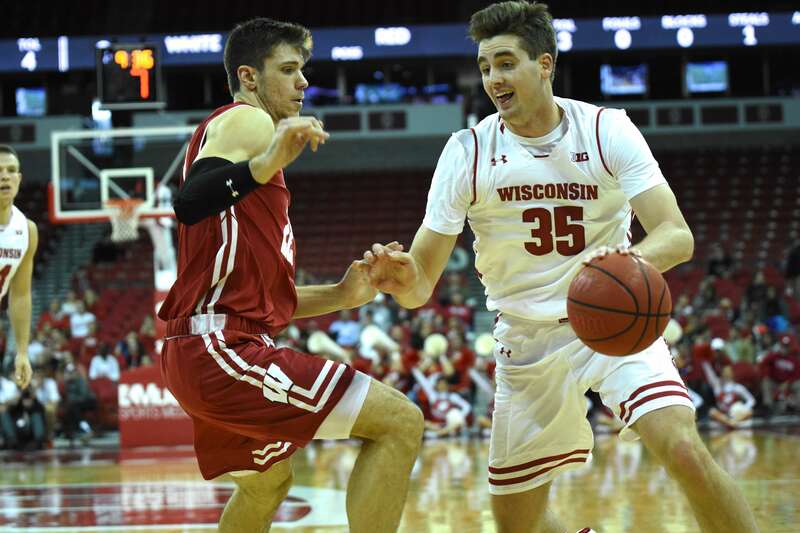 Though his post-up game is under-developed, Reuvers has had the benefit of practicing alongside Ethan Happ, who has arguably one of the best post-up games in college basketball history. Reuvers has the opportunity to adopt Happ’s unique offensive skillset — in particular, his superb footwork — into his own game. Not to mention that Reuvers added 35 pounds of muscle to his frame this past offseason. It is not a stretch to say Reuvers has the potential to be the next Kaminsky because he is being given all the right resources to get there, along with showing Badger fans his work ethic and passion to succeed on the court. Reuvers’ style of play is eerily similar to that of Kaminsky, especially with the type of energy and enthusiasm that he plays with. Both always look hungry to knock down a big shot, throw down a jam to get the crowd into the game or swat somebody’s shot back into the stands. They both play defense and can score down low on command with the ability to step out and knock down the three-point shot. But what separates the two is Kaminsky’s clutch factor and ability to drive the ball to the hoop from the perimeter. Reuvers still needs to work on his speed and ball handling if he wants to elevate his game to Kaminsky’s level. On the bright side, Reuvers has plenty of time to improve his game. As a sophomore, Kaminsky was averaging just 4.2 points per game and 1.8 rebounds per game. Reuvers is doubling just about every single one of Kaminsky’s sophomore year statistics, even in minutes — Kaminsky was only getting 10.3 minutes per game compared to Reuvers’ 21.4 in 2018-19. Reuvers has started every game this season and is going to reap the benefits of all the on-court experience he is gaining while playing in a much tougher conference than Kaminsky did in his first two years. There is no telling if Reuvers can elevate the Badgers to the high-caliber team that Kaminsky did, but with his height and the ability knock down shots from deep, there is no ceiling on Reuvers’ potential. Reuvers is not an awful basketball player, but he will never come close to the level play and Wisconsin legacy of Kaminsky. Yes, he is a solid shooter from behind the arc, and yes, he is only a sophomore, but Reuvers does not utilize the 6-foot-11 frame he was blessed with to his advantage. If you look at the numbers that Reuvers has produced in his first two seasons — 6.8 points per game, 2.4 rebounds per game and 1.2 blocks per game — and compare them to the numbers from Kaminsky’s first two seasons — 2.9 points per game, 1.6 rebounds per game and 0.4 blocks per game — it may appear that he is on track to surpass what Kaminsky did later in his career. But Reuvers has done so in 18.7 minutes per game at Wisconsin, more than doubling Kaminsky’s 9 minutes per game during his first two seasons. But despite playing far fewer minutes to start his UW career, Kaminsky’s career player efficiency rating — a stat made to compile all of a player’s contributions into one number — is 30.1, nearly twice as much as Reuvers’ 15.7 PER. Until Reuvers expands his game to include something other than waiting for a pass to shoot the ball from the top of the key, his name does not deserve to be mentioned in the same sentence as Badger legend Kaminsky. Oh, and lose the short-sleeve undershirt. Reuvers is one of the unique big men in college basketball. The near seven-footer can shoot the ball from deep, but he can’t seem to play in the paint on offense. While some of this can be attributed to playing next to All-American center Happ, I’m still intrigued by Reuvers’ modern skillset for a big-man. It will be interesting to see how Head Coach Greg Gard uses Reuvers and how Reuvers performs without Happ next season. Reuvers can clearly shoot the ball, but will he be able to play down low? I think the answer is likely yes. Reuvers has performed well when given the opportunity. For example, he’s had at least one block in his last nine games, including five against Penn State. He also had a nine-block performance against Stanford early in the season. He’s also averaged three rebounds per game, which is impressive considering he mostly stays on the perimeter and doesn’t get a ton of playing time. I think it’s safe to say that Wisconsin will continue to be led by a dominant big man for at least two more years after Happ’s departure this spring. As Happ’s senior year closes, there’s an unspoken weight inching closer to the shoulders of sophomore Reuvers. The “Wisconsin big” torch has been passed from Brian Butch, to Jon Leuer, to Jared Berggren, to Kaminsky, to Nigel Hayes and eventually to Happ. As he assumes this coveted role in 2019-20, Reuvers continues to garner comparisons to Kaminsky. Both played minor roles in their freshman seasons and progressed nicely in their sophomore years, but will Reuvers make that leap next season? In his junior season, Kaminsky skyrocketed his points per game by almost 10 from the previous year while hauling in 6.3 rebounds per contest. If Reuvers expects a similar junior jump, he will have to up his comfort level with the ball in his hands. Kaminsky was a threat beyond the arc, but he also made opposing teams pay for closing out too aggressively by accelerating to the rim after a pump fake. Reuvers has shown some touch around the basket, but his quickness to the rim is lacking. Comparisons simply cannot be made between the two. You cannot compare two years of Reuvers with the finished product of Kaminsky. But as Reuvers’ career plays out, he will not truly deserve the Kaminsky comparison unless his individual success is coupled with team success.